Nuvyyo has introduced a new version of its Tablo over-the-air DVR. The new Tablo DUAL is a two-tuner DVR that adds 64 GB of onboard storage, so you do not have to bring your own USB storage device (as you did with the original Tablo). You still have the option to add more storage (up to 8 TB) via USB, though. The Tablo DVR connects to your home network via Ethernet or Wi-Fi, allowing you to stream your live and recorded content to media players, smart TVs, computers, and mobile devices. 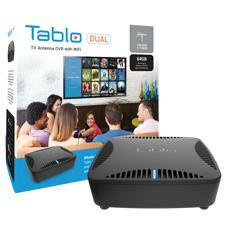 The Tablo DUAL will be available June 4 for $249.99. Nuvyyo has announced the launch of Tablo DUAL, its next-generation 2-Tuner OTA DVR. The first networked OTA DVR to include onboard recording storage, Tablo DUAL makes it even easier for cord cutters to discover, record and stream live broadcast programs from their HDTV antenna, right out of the box. Fully redesigned with a 20 percent smaller form factor, Tablo DUAL adds 64 GB (approximately 40 hours) of onboard HD recording storage to the easy-to-use live TV streaming and one-touch recording features of the original Tablo 2-Tuner OTA DVR. Cord cutters who want even more room to store their favorite broadcast TV shows and movies can also connect a USB hard drive to boost the recording capacity up to 8TB. "We are making it easier than ever for unhappy cable and satellite customers to make the switch from expensive cable to free antenna TV," said Grant Hall, CEO of Nuvyyo, "By incorporating WiFi network connectivity and onboard storage, the Tablo DUAL is the best and most flexible choice for cord cutters seeking a whole-home DVR solution to record and stream today's most-watched TV programs." Tablo DUAL will be available starting on June 4, 2017, in the U.S. at an MSRP of $249.99 USD exclusively at select Best Buy retail stores or online at www.BestBuy.com and in Canada, direct from Tablo (www.TabloTV.com/store) at an MSRP of $329.99 CAD. Tablo DUAL includes a free 30-day trial of Tablo's optional TV guide data subscription, which provides episode and series synopses, cover art and metadata for programs airing over the next two weeks, as well as access to advanced features like one-touch series recording and out-of-home streaming via Tablo Connect. Once the free trial is complete, users can choose a subscription starting at $4.99 USD/$5.99 CAD monthly, $49.99 USD/$59.99 CAD annually, or $149.99 USD/$179.99 CAD for a lifetime subscription. • Visit the Tablo TV website for more product information. • Tablo Adds Apps for Apple TV and LG WebOS at HomeTheaterReview.com.